All of these Greene County homeowners moved here to enjoy the quiet area and rural scenery, buying land and building homes on good sized lots next to agricultural and residentially zoned areas not too far from Ruckersville city center. Tranquil. What could go wrong? Then, one neighbor managed to get county permission to start a gun shop business on his private property (unbeknownst to the majority of neighbors) and the slippery slope of altering the nature of the entire area had begun. This gun range proposal is a direct result of the gun shop owner wanting to expand his business in a way most convenient for him: Agricultural land his family already owns and no commute – he’ll be able to walk from his home to his gun shop and adjoining gun range on the farm property next door. Here’s the view from 283 London Court. These Greene County homeowners can look forward to gazing out over a narrow pasture to a 20-lane, outdoor gun range with “room to grow”. The retired couple that live here are actually trying to sell their beautiful home. 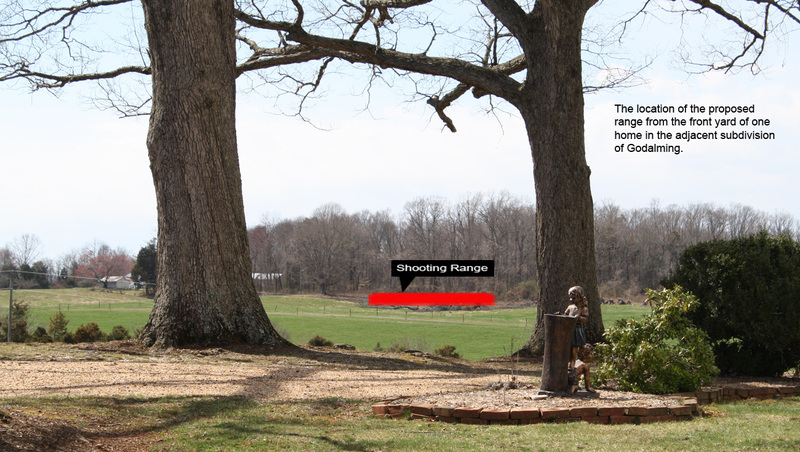 One can only imagine the prospective buyer’s expression after touring the home and then having the real estate agent say, “…and I have to mention the possibility of a gun range being right over there”? 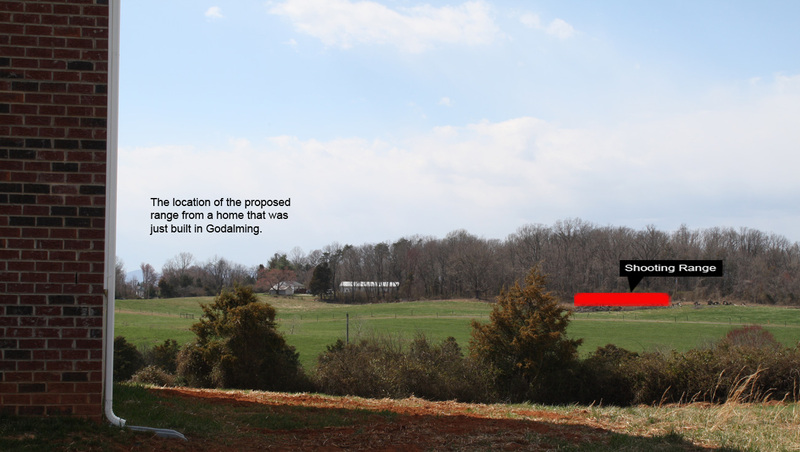 Pictured here are two properties just east of the proposed site, with a small tract of land separating them from the proposed shooting range. The home at 141 London Court was built about 10 years ago and the homeowner added the pool house later, building it from the ground up with his own sweat and blood. Now, the homeowners may have a great view of a gun range and the kids may be swimming in their pool to the sounds of constant gunfire. Oh, and there’s that not so little thing about home investment and equity dwindling. So much for home improvements. This home was just built. These unfortunate homeowners may be enjoying their beautiful Blue Ridge Mountain views with a 20-lane outdoor gun range in the foreground. They get gunfire along with the immediate depreciation of their home. What is that saying about buying a new car? It depreciates thousands of dollars as soon as you drive it off the lot? In this case, it’s tens of thousands of dollars and it’s people’s homes. Homes which are, in many cases, the main investment for theirs and their children’s future. These are just three homes near the proposed site. There are numerous homes even closer and there are over 100 within a 1/2 mile radius. One can do the math and see that loss in property values of all those homes will significantly outweigh any additional revenue this business can bring into the county. But besides the crushing monetary loss these families face, it’s just wrong to do this to so many Greene County citizens’ way of life. That just plain isn’t neighborly. Put in a few turkey houses, which can be done by right. I wonder what property values would do. Buying a lot in the “country” does not give you title to all surrounding properties. At least not in the South. That’s the spirit! Just do whatever you want and never mind the neighbors! And rules. And county guidelines. Let’s us go and sell to WalMart to build a huge warehouse. I don’t think they’d appreciate that. We’re not asking for “title to all surrounding properties”, just some consideration of all your neighbors and their quality of life and, yes, investments in their property. Don’t know much about turkey houses, but I don’t think a potential buyer of a property would walk away if they knew a turkey farm was next door. You can usually find anything on the internet to back up your cause. For instance, according to the CPSC website, an average of 390 children from birth to 14 years old die in swimming pools each year. If the owner of the house with the pool sells, will he point out this startling information? According to OSHA, that’s close to the same number of death each year in construction. Should the land owner point this out to someone that shows interest in the land? While all the websites I visited on firing ranges says the death rate is so low that there isn’t any reports on it. Check the internet for all your activities & before long you won’t leave your house. And please, stay out of the bathtub. More than 43,000 children were injured in them in 2009. “If the owner of the house with the pool sells..”? Is that a joke? 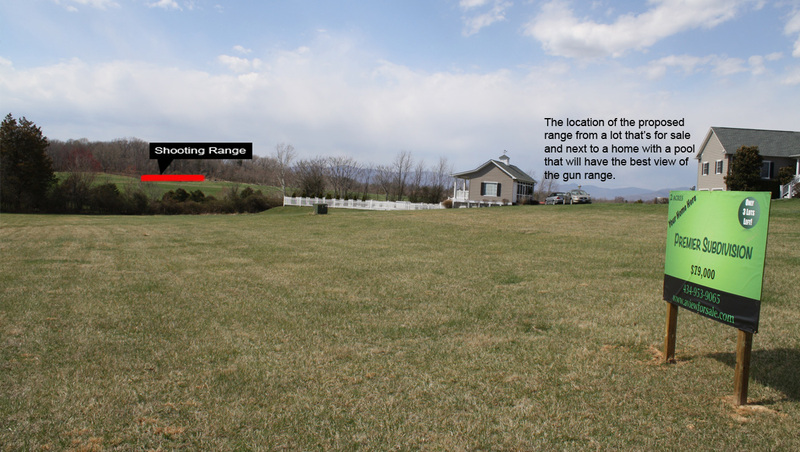 No one would buy that house overlooking a shooting range. At least not anywhere near its value. That’s the point here. All his neighbors will have their home values devastated. Not to mention quality of life. You can believe what you want, but there will be noise with an open air range. And yes, pools and construction sites can be dangerous, but a pool buyer and the construction worker go in knowing that. All the residents around this farm zoned for agriculture never imagined they were building next door to a future gun range. Entirely different story if the range was there first. The way I see it – They own the land and it is theirs to use as they wish. It irks me when someone thinks they have a right to tell other people what to do with their property. Well, it irks me when a neighbor changes the entire nature of his agriculturally-zoned property into a loud, potentially dangerous commercial venture that will negatively affect all his neighbors’ property values. Is that a good neighbor? Yes, you can do what you wish with your property within reason and the rules. The rules and county guidelines read as if they prohibit this venture. If there were no rules on land use, anyone could just build anything anywhere – it’s called city/county planning. Why don’t we just go and build a big Costco on our land next door? This is America, dammit! Free country!